Steel idler sprockets maintain proper chain tension, and guide the chain around obstacles and prevent excessive chain wear and vibration. You don’t need any special tightener shafts for ball bearing idler sprockets. Composite sprocket idlers require no lubrication and are corrosion resistant and wear-resistant. An idler sprocket is a device used to maintain the tension in a chain or chain drive system. Often consisting of nothing more than a sprocket mounted on a spring tensioned arm, the idler sprocket pulls against the chain in a constant manner to keep the chain tight at all times. The size of the sprocket used in an idler sprocket assembly has no effect on the performance of the chain drive; however; a larger sprocket will often last longer due to the slower speed of the sprocket, which saves wear on the sprocket’s bearings. Maintenance for the idler assembly is commonly no more than an occasional greasing of the sprocket’s bearings. When driving a machine by chain, the tension of the chain must be kept at a constant to avoid the chain coming off of the drive sprockets. By installing an idler sprocket in the drive system, the chain is kept taut while not being over-tightened. Operating a chain in an over-tight condition can result in premature bearing and chain failure while an idler sprocket placed in the system is often a way to greatly extend the life of the chain, sprockets and the bearings on the machine’s sprocket shafts. The ideal installation of the idler sprocket is on the opposite side of the chain between the drive sprocket and the driven sprocket. The application should place the idler sprocket in a position that has the sprocket pushing or pulling the chain towards itself as it loops the two primary sprockets in a shape similar to the letter B. This design will allow the pulleys to pull the chain hard without hindering the idler in any way as the drive chain passes over the sprocket. If a condition presents itself which requires the drive to exert excess pressure on the drive chain, the idler will flex against the chain, allowing it to expand while remaining in contact with the drive sprockets. 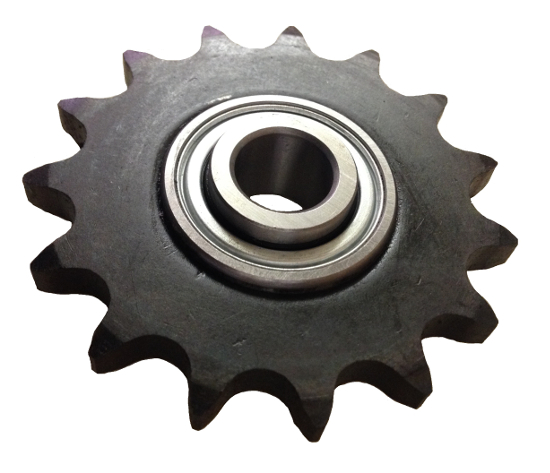 While the vast majority of idler sprockets are manufactured of steel, many materials are used to manufacture an idler sprocket. Many poly or composite sprockets have been used with great success and some wooden sprockets have also been used on some machinery without issue. Many machines, in an attempt to reduce the wear on the drive chain, use an aluminum, cast iron or steel sprocket coated in a nylon material. The metallic hub allows the idler sprocket to remain very strong while the nylon covering is gentle on the chain links. 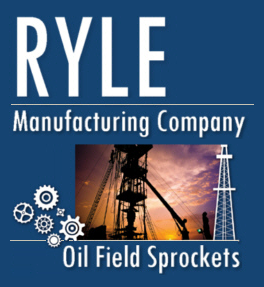 Ryle can deliver Idler Sprockets from our huge inventory, or custom make to your specifications.